Microsoft held an event yesterday in New York where they unveiled a new family of Surface devices that all look pretty incredible. They also announced the availability of the big October Windows 10 update that prepares the OS for what could be a really important new feature: Android app mirroring. 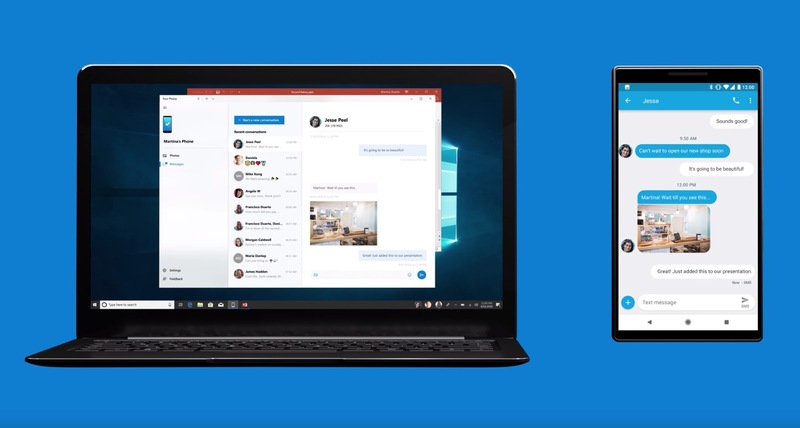 Within the October update for Windows 10, Microsoft is including a new Your Phone app, that lets you send and receive text messages from your Windows computer (see above). It lets you view the photos you’ve recently taken with your Android phone too. But in the future, Microsoft says that they will expand the functionality to include use of any app on your Android phone within Windows. They’ve haven’t posted any details on this future upgrade, but The Verge was at the NYC event yesterday and says that Microsoft showed off a brief demo that involved Snapchat messages between people. That’s really all we know. No date for expansion of Android app mirroring was mentioned, nor was the level of functionality. However, if Microsoft can figure out a way to do Android app mirroring of any app, we’re talking about a pretty significant integration of Android and Windows. Chrome OS currently does this best, since it has Google Play and the ability to run Android apps, but this would give similar power to your Windows computer. For now, if you want to try out the SMS and photo mirroring portion, you can install the Your Phone app (Windows, Android) on your Windows machine and also on your Android device.